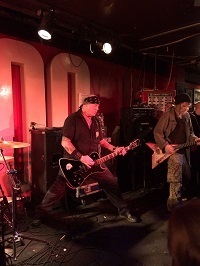 Those first couple of weeks of the new year are always a bit dull and gloomy, so thank heavens for the Resolution festival at the 100 Club, which crops up in those two weeks of each year to lift the gloom with a whole host of punk bands, old and new. 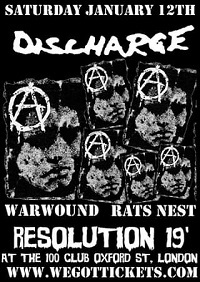 This year has seen usual suspects like Vice Squad, Anti Nowhere League, Subhumans, Vibrators and GBH grace the stage and tonight brings together two influential pioneers of D-beat/UK82 punk in the shape of Discharge and Warwound. With this being a Saturday night, the 100 Club is pretty packed and everyone has turned up in time for Warwound’s blistering set. Warwound deliver an intense, vicious and quite often warp-speed barrage of noise in keeping with the original band’s early 80’s pioneering D-Beat punk. The line-up has changed a few times since then, and since reforming in 2015 the sound has developed to incorporate elements of doom and thrash to fine effect, with guitarist Damien Thompson, also of Sacrilege, delivering some tasty Slayer-esque licks in places. It gets a great reception tonight, and deservedly so, giving this gig the feel of a double bill with Discharge to follow. Vocalist JJ has been at the helm for Discharge for just about five years now, and his debut album with the band, 2016’s ‘End Of Days’, was for me an absolute barnstormer from start to finish. So it’s a bit surprising that so few songs from that album feature in the set, with only ‘New World Order’ and ‘Hate Bomb’ making the cut, and great they sound too. Mind you, when a band has a debut album as classic and influential as ‘Hear Nothing See Nothing Say Nothing’ in their locker, it’s difficult to ignore it and so the likes of ‘The Blood Runs Red’, ‘The Nightmare Continues’, ‘A Hell On Earth’, ‘Protest and Survive’ and of course the title track all feature, and all remain potent. Single and EP tracks from the same era are in plentiful supply too, with ‘Fight Back’, ‘Realities Of War’, ‘State Violence State Control’, ‘Never Again’ and ‘Decontrol’ sounding glorious. Even Cal Morris’ final album ‘Discharge’ is well represented with ‘Hype Overload’, ‘War Is Hell’, ‘Accessories By Molotov’ and ‘Corpse Of Decadence’ included. It’s all delivered with power, energy, angst and aggression in the true spirit of the original band, with less metal leanings than Warwound’s contemporary sound. And, of course, ‘Grave New World’ is soundly ignored, and buried in the past, as it should be. The classic ‘The Possibility of Life’s Destruction’ rounds things off perfectly. A blistering set by a still potent band, whose legacy and influence speaks for itself. Let’s hope they follow up ‘End Of Days’ in the near future, as Discharge still have plenty to say.